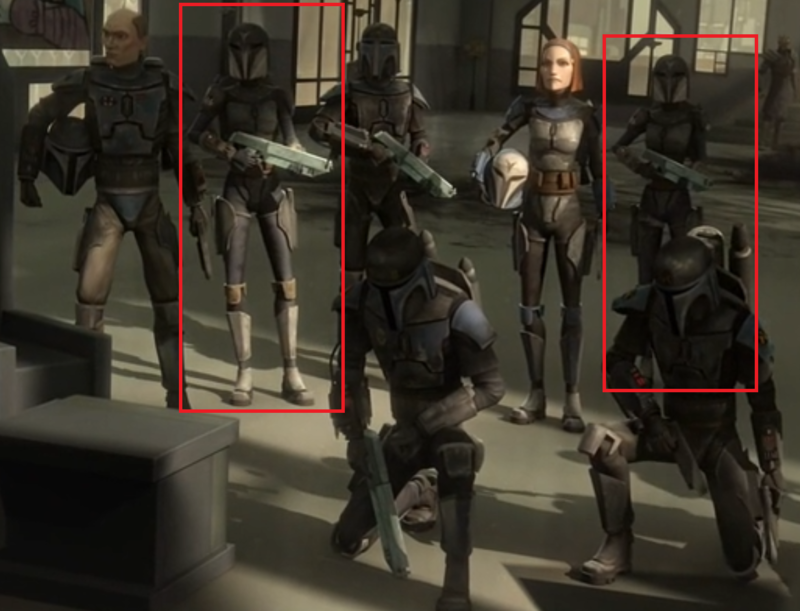 Ooooh...so she is the unnamed female Mandalorian death watch member in the TCW scene where Pre Vizsla got killed by Maul.....one asked female is Rook Kast and the one possibly standing behind Bo Katan is Sabine's mother. Wow so that latest episode. It was cool to meet Ursa and Tristan. Ursa was awesome and regal. Also it was hilarious the way she kept throwing shade on everyone. The icy lake and the snow was a beautiful setting for the episode, as well. And I'm so sad Sabine isn't going to be a part of the ghost crew anymore!! I guess I should've seen it coming, but it just feels so wrong! 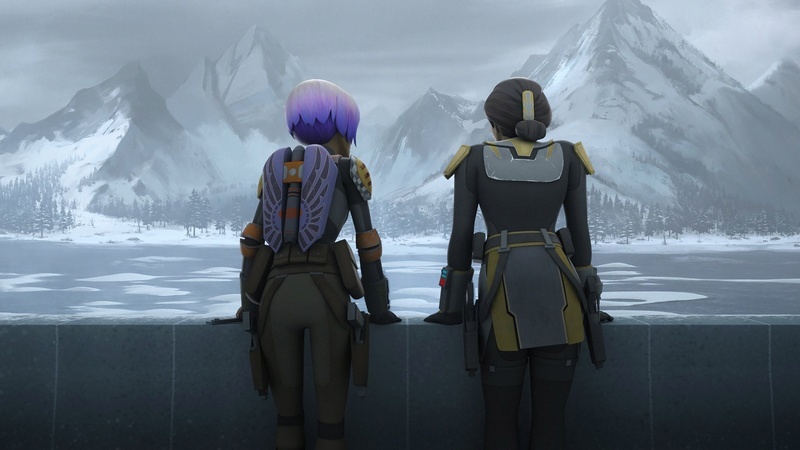 :'( Will Rebels as we know it end after season three? Filoni said they would explore the future of the Mandalorians in the future, so I hope the tv show goes on in some form. They are getting so close to the rogue one/a new hope part of the timeline, I guess, that things are going to start changing a lot. It was cool that Sabine used Ezra's lightsaber to fight for the darksaber. It just keeps proving you don't need to be a Jedi to wield a lightsaber. And thank goodness for Fenn Rau he totally saved them all xD. @jakkusun wrote: Wow so that latest episode. It was cool to meet Ursa and Tristan. Ursa was awesome and regal. Also it was hilarious the way she kept throwing shade on everyone. Aren't there rumours going around that Dave Filoni is working on a new animated series? Maybe it might be about Sabine and the Mandalorians during the events of RO and the OT? I still could not watch the last episode. Not available yet for viewing. So is Sabine staying to fight with the Mandalorians? I somehow had a strange feeling on this. They were really focusing on her more lately. And it's getting crowded too. But she could be part of some episodes as guest, no? I want to know what happens to Kanan! I call it now. He'll retire from the whole Force thing and be a stay-at-home Dad. Yes, I still have my hopes up for a human-twi'lek hybrid Apparently there were 2 in TCW so why not? @SanghaRen wrote: I still could not watch the last episode. Not available yet for viewing. So is Sabine staying to fight with the Mandalorians? I somehow had a strange feeling on this. They were really focusing on her more lately. And it's getting crowded too. But she could be part of some episodes as guest, no? I want to know what happens to Kanan! I call it now. He'll retire from the whole Force thing and be a stay-at-home Dad. Yes, I still have my hopes up for a human-twi'lek hybrid :) Apparently there were 2 in TCW so why not? Yeah comments from Dave have made it sound like she's not gone from the story forever. "I don't want to ruin anything," Filoni teased, "But I would think that she's a pretty beloved character. I've brought characters back from much father depths than simply 'I want to spend some time with my parents.' I actually had to sew Darth Maul somehow back together." "It's very possible that we haven't seen the last of Sabine," he finally said. Phew. "I don't think that's a massive spoiler on any level. I think it might relieve the tension for people that are having a heart attack. Not everything needs to be this bizarre conspiracy kind of thing." I love Dave Filoni's attitude about mysteries and spoilers because he actually has sympathy for the fans and will say slightly spoilery things to put our minds at ease, unlike the ST creators who will let us all suffer in a in mystery-box hell as long as possible (though they don't seem to have much of a choice I guess--seems like the company leaders want it that way xD). Yeah I'm actually really curious about what both Kanan and Ezra are going to do. Are there really going to be other Jedi out there at the same time as Luke or not? It worries me. 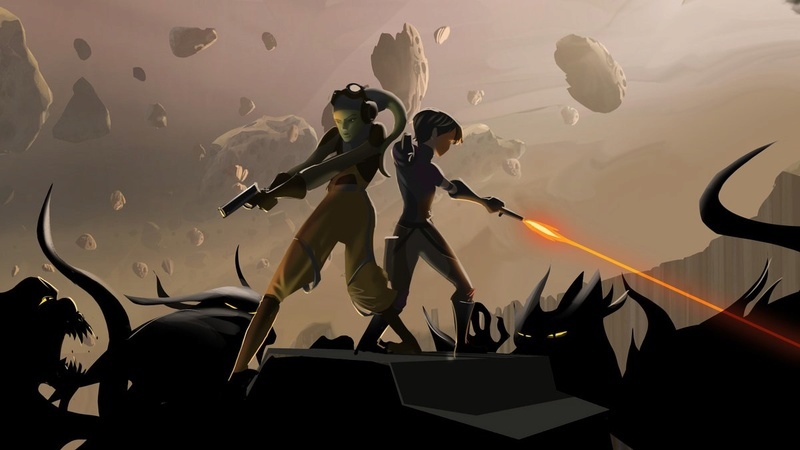 "But I wouldn’t worry that this is the last we’ve seen of Sabine, even Filoni is willing to admit “I think we will have to have Sabine back in a bit because she’s just too fun.” I think even the episode suggests this isn’t the last time we’ll see her, with Sabine vowing to find someone else to wield the Darksaber as Mandalore’s ruler once again. But who could that possibly be? The most likely candidate is Bo-Katan Kryze, a character played by Katee Sackhoff on Star Wars: The Clone Wars. Sackhoff already messed up and said that she was recording lines for the series at a convention appearance last year and even Filoni admits there is a “probability” of Sabine running into Kryze..."
After reading Aftermath: Empire' End, I think the new series could be about the Flight Academy on Hosnian Prime mentioned at the end of the Empire's End book which Snap Wexley is about to join....Snap Wexley should be around Ezra's age in season 1 of Rebels so they can introduce a new generation of young characters and show us life in the New Republic. I'm really really worried about Kallus now after watching Through Imperial Eyes. It was a cool episode though. @jakkusun wrote: I'm really really worried about Kallus now after watching Through Imperial Eyes. It was a cool episode though. Btw, I think there was some potential foreshadowing regarding Ezra's future.....when Kallus asked him to dress as Lt. Lyste, he said he'd be more comfortable as a bounty hunter.....maybe he left the rebellion for some reason and turns bounty hunter in the future? Right!? He is good but he's not good enough to out-smart Thrawn. In continuation of me being tired and getting all confused, I mixed up my episode numbers and was waiting for the Mandalorian episode to be on when it was since days. So I watched now both 15 and 16. #15: I am impressed by the quality of the animation. The landscape, but also the eyes of Sabine and her mom. The reflections in their eyes are really nice. I was captivated. #16: I am surprised Thrawn only figured it out now for the Fulcrum. I thought he had already guessed it. So Thrawn might start to feed him wrong information. It would be quite twisted if Kallus ends up being killed by the Rebellion he's trying to help. Yeah, it was a bit arrogant of him to believe he could fool Thrawn. Ezra as a bounty hunter? I don't know. Bounty hunters are not exactly nice people and it's rather an ugly world. I mean they are asked to kill too and it does not seem as though they can be too picky on which bounties they take or they end up with a bounty on their own heads. So Ezra ending up as a bounty hunter does not sit well with me. Space pirate, maybe. I think Thrawn will show his true capabilities in the season finale....I have this terrible headcanon that Thrawn will use the weapon designed by Sabine to destroy the rebel base...the same weapon that was used on the Mandalorians that got her branded a traitor.....that would definitely create a challenging arc for the next season. 1. Love the aesthetic in the Mandalorian episode....and especially loved the painting of Ursa in her throne room....reminded me of the works of Gustav Klimt somehow. 2. 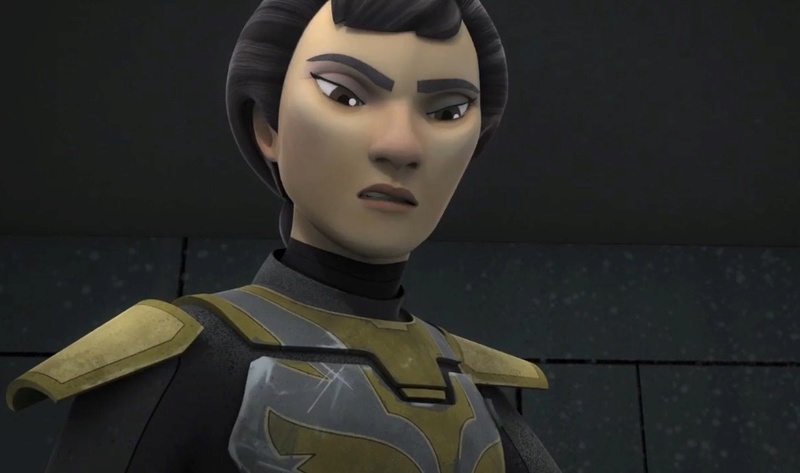 I have a feeling we'll see a lot of Hera in the final couple of episodes when Kanan and she have to defend Chopper Base, especially with Sabine gone. 3. I find bounty hunters much more interesting than pirates as they have a lot more heart and often choose to help people over money (something pirates like Hondo would never do)......take Sugi and Embo from TCW who helped Anakin save villagers in a seven samurai scenario.....Embo and Dengar saved Jas's life in Empire's End...Jas saved countless lives despite being a bounty hunter.......Ventress did some of her most noble deeds as a bounty hunter like saving the little Pantoran girl from a force marriage in TCW, saving little children in Dark Disciple and helping Ahsoka too in TCW....even Boba Fett saved Ventres's life when he could have left her to be killed by Dooku....and most importantly Sabine was a bounty hunter before she turned rebel....that is probably why I favour bounty hunters....but I won't mind if he becomes a pirate either.....either option works as long as he isn't just killed off. Agh yeah that makes sense--tying all the plot together by using Sabine's weapons in the finale like that. Embo is my favorite bounty hunter!! and he's really cool because he was voiced by Dave Filoni, apparently. And he has such a cool hat and a dog and !!! yeah he's awesome. A lot of bounty hunters are a lot more morally grey and even kind of good sometimes, so that is a good point. Some are really bad though like cad bane xD I love him because of his efficiency and skill, but he is pretty much heartless. Bounty Hunters are cool because of the range of morality I guess. I'm not in love with the idea of space pirates but Ezra has mingled with pirates throughout the show, so I thought it was a possibility. Though, idk if they would ever actually go either of these routes with Ezra. Oh that is an interesting theory Thrawn using the weapon created by Sabine to destroy the rebel base. Maybe we will get a fight Hera Thrawn. They probably have something in store for Hera. I don't have your knowledge of the SW universe but the little I have seen so far about the "good" bounty hunters is that they start off as bounty hunters usually out of necessity and then move out if it when reconnecting to the humanity they were trying to bury, not the other way around. I actually enjoyed Bazine in all her dark greyness. The thing is Ezra has had his brushing with the dark side but he's turned into a more level-headed sometimes cocky young man with grounded values. I'd hate to see him turn around and do things for money. That's my thinking. Some pirates seem to be manipulative in SW but not dangerous per se. I guess, I am not fond of any of the 2 options actually. Could he actually become involved in the Church of the Force hiding on Jakku? Watching over Rey from a distance. Just a random thought coming from nowhere. I think they've already recorded the season 4 episodes so we're definitely getting one more season....but we might not get a season 5 or we might get an animated movie winding up the show since. Embo is one of my fav. 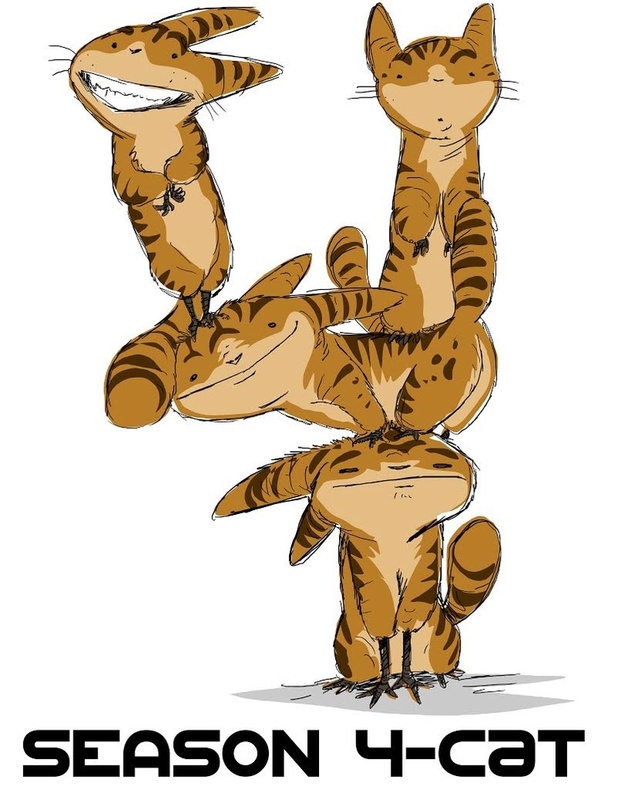 characters as well and his Anooba Marrok is adorable....I hope we see him on Rebels considering he has a history with Sabine (its hinted in her art work that he helped her against Cad Bane in the past). Speaking of pirates and bounty hunters, we're getting to see Cad Bane and Aurra Sing in the upcoming Darth Maul comics....that should definitely be interesting....especially since Aurra Sing was dating Hondo Ohnaka around that point of time. I'm not sure if Ezra would join the Church of the Force...in Empire's End, we see that they're very accepting of death and a very pacifist group, allowing creatures to kill them and not resisting...I can't imagine Ezra being like that. He could always join some other force worshiping group since we know there are many of them around. Given a choice, I rather he married Sabine and joined the Mandalorians- since we don't see Mandos in the rebellion, maybe they dont join and instead Ezra has to choose which side to join. The Mandalorian Episode makes me feel Ezra really likes Sabine a lot and I'd love to see them end up together. I only thought the bounty hunter option was possible because Ezra himself said that he would prefer to be disguised as a bounty hunter in the Eyes of the Empire episode and I wondered if it was some sort of foreshadowing- or the thought wouldn't have occurred to me. So with the announcement of Season 4, do you guys think 4 will be the last season? Do you think Maul is finally going to get killed off either in the Kenobi duel or sometime during season 4? @Helix wrote: So with the announcement of Season 4, do you guys think 4 will be the last season? Do you think Maul is finally going to get killed off either in the Kenobi duel or sometime during season 4? I think Maul is definitely going to die or at least exit under mysterious circumstances in the season finale. There seems to be a trend in season finale episodes where one important character dies and another important one is introduced. Going by this trend, a dark side person has to exit/die and a light side character has to make an appearance. I would have said it was Obi-wan but he never leaves Tatooine as he is watching over Luke, and it would mean an error in continuity....so it has to be someone else- Yoda maybe? Or maybe Chirrut and Baze?